A safe, as defined by Webster’s dictionary is, “a container for keeping articles (as valuables) safe”. By that definition even a fishing tackle box could be considered a safe, but I certainly would not trust a tackle box to secure my valuables. Clearly the term needs to be refined. It is important to know what kind of security a safe offers to avoid investing in a false sense of security. Ratings, classifications and labels help with this understanding. There are two different systems used to describe levels of burglar security: construction ratings and performance ratings. 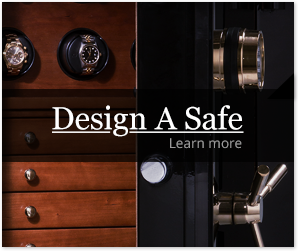 Construction ratings describe how the safe was constructed while performance ratings are designated by Underwriter’s Laboratory (UL) and indicate a minimum standard of performance during testing. In some cases these UL ratings also include construction requirements. The Residential Security Container (RSC) rating is awarded by Underwriters Laboratory (UL) to safes that are able to withstand a 5-minute attack by UL safe technicians. These technicians are far more advanced in their attack methods than the typical home burglar; they attack the safe with rigorous prying, drilling, punching, chiseling, and tampering. After 5 minutes of net attack time (not counting the time changing drill bits, tools, etc. ), if the technicians are unable to open the safe, it is awarded the RSC rating. Pro Tip: The typical home burglary is over in 5-10 minutes. Casoro Jewelry Safes, designated RSC+, had no problem passing this test and in fact are built to withstand well beyond this test. This rating indicates the safe successfully resisted entry* for a net working time of 15 minutes when attacked with common hand tools, picking tools, mechanical or portable electric tools, grinding points, carbide drills, and pressure applying devices or mechanisms. Pro Tip: Safes at this security level and above are appropriate for higher value collections and/or when you feel you may be targeted by a professional burglar. This rating indicates the safe successfully resisted entry* for a networking time of 30 minutes when attacked with common hand tools, picking tools, mechanical or portable electric tools, grinding points, carbide drills and pressure applying devices or mechanisms, abrasive cutting wheels, and power saws. The TRTL-30 rated safe has all the same capabilities as the TL-30 with the added protection against oxy-fuel and gas-cutting or welding torches. When x6 is added to the end of a TL or TRTL rating, i.e. TL-15×6 or TL-30×6, the x6 indicates that the safe passed the designated test on all six sides. *Entry = opening the door or making a six square inch opening entirely through the door or front face. Casoro is the INDUSTRY LEADER when it comes to quality, service and design. We offer Customization and Luxury with White Glove Service. Only Casoro has 100% UL verified burglar protection. Know your precious valuables are safe and protected by choosing Casoro Jewelry Safes. Learn Why Casoro is Best!